A football player from Hemyock has been awarded player of the year for the third year running. Josh Leach, 11, was presented the Exeter Friendly League Manager's Player of the Year for Hemyock for the third year running last Friday. 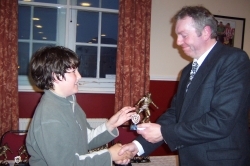 The sport star, who plays for the under 11s first won the award in 2003. Josh, who plays as central defender and has scored four goals for the club this season, said: "I was surprised that I won the trophy again, but it's great because there are other good players on the team." The award was presented at St James Park, Exeter, by John Penkethman, chairman of the Exeter Friendly League. The Youth Football Club has recently started training on the new football pitch at Longmead, Hemyock. An all-weather pitch and changing rooms are due to be built on the site as part of the on-going redevelopments. Anyone wishing to join Hemyock Youth Football in time for the new season should attend the signing-on sessions held by Mark Jordan, chairman of the club at the Catherine Wheel, Hemyock from 7-9pm on July 20, July 27 and August 3 and August 10.